Sharks are commonly perceived as man-eating monsters, driven by an insatiable hunger for other animals; an image that is regularly enforced in the media. As we learn more about these fascinating and misunderstood animals, we are realising that this picture is far from the truth. These animals are complex and have other things on the menu than just humans. From the 30cm velvet belly lantern sharks that live in the deep-sea and produce their own light to the massive whale sharks that regularly reach over 10 m and feed on some of the oceans smallest animals (plankton), sharks are anything but monsters. Instead, this hugely diverse group of fish that include over 500 species is poorly understood and we have a limited understanding of the feeding and movement behaviours of most species. Sharks are a diverse group of fish that range from massive 10 m whale sharks to hand size velvet belly lanternsharks as pictured above. We still know relatively little about the movement and feeding behaviours of most of the 500+ species. 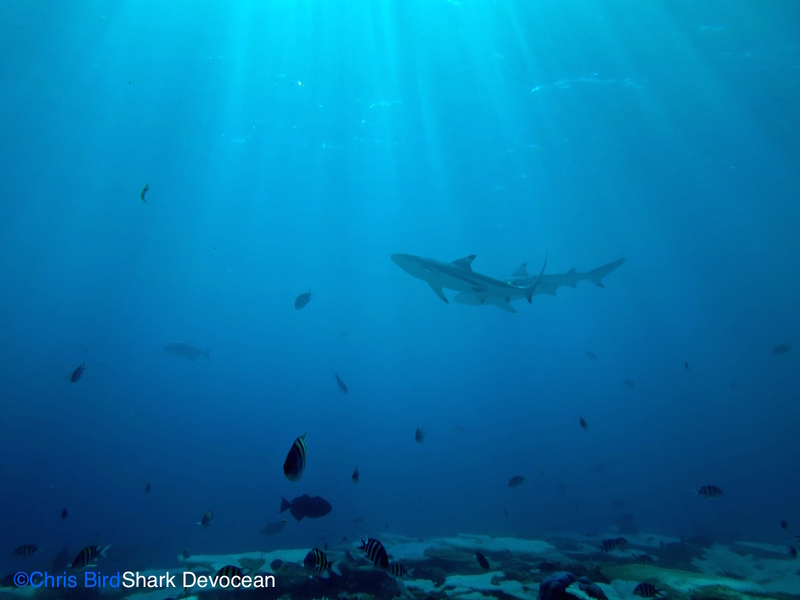 Many shark species are extremely vulnerable to human activities, such as overfishing and habitat destruction, and many populations of sharks have substantially declined in the last 50 years. 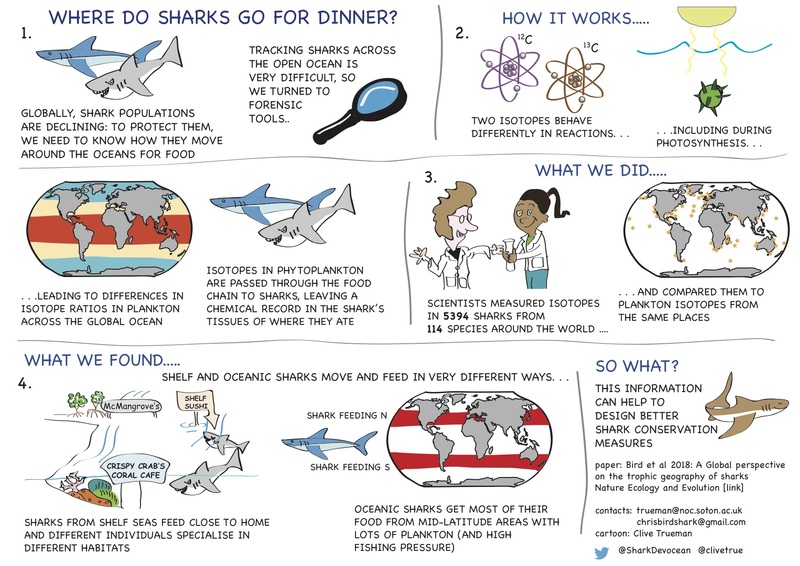 What effect these declines in shark abundances will have on marine ecosystems is still not fully understood and remains widely debated, but understanding how sharks move through the oceans to feed is an important step along that road. In our group at the University of Southampton we mainly study diets and movements of marine animals using natural chemical tracers. Our paper in Nature Ecology and Evolution began rather accidentally, when one of us (lead author Christopher Bird) was doing his PhD research on deep water sharks, and a planned cruise was delayed. To fill this time, Christopher began to compile existing data on other sharks, rays and chimaera, ultimately leading to a major international collaboration bringing together 73 scientists from 21 countries. The subsequent project has allowed us to build a global picture of the relationship between the place where a shark was caught, and the likely location of the food webs where it previously fed. To do this, we used stable isotopes of carbon in shark muscle as a natural tracer. Carbon (C) forms the basis of all life on earth and exists in different forms, or isotopes. The relative abundances of the two stable isotopes of carbon 12C and 13C in marine phytoplankton vary systematically with latitude, and among different coastal primary producers such as algae, seagrasses and mangroves. Differences in carbon isotope compositions are then passed from phytoplankton to consumers throughout food webs during feeding. This works of the premise of “you are what you eat” and also “you are where you ate”. Distribution of carbon stable isotope data collected from sharks imposed on map of predicted stable carbon isotope values in phytoplankton. If you want to use stable isotopes to say something about animal diets or locations, you need to know how stable isotopic compositions vary in time and space. The global ocean is huge, mostly inaccessible and poorly sampled, limiting the use of stable isotopes as tracers in migratory marine animals. We overcame this obstacle by comparing stable carbon isotopic compositions of sharks to a global model of carbon isotope compositions in phytoplankton that we developed in Southampton and published earlier in 2017. Our main premise underpinning the study is that if an animal fed in the place where it was caught and sampled, the carbon isotope compositions in the shark and local phytoplankton will match. However, if the shark has moved between feeding and capture, then the signals will be different. We built a dataset of carbon isotopes in more than 5000 sharks from 114 species across the globe and found that sharks living in the open ocean feed very differently from those living in coastal or shelf waters. 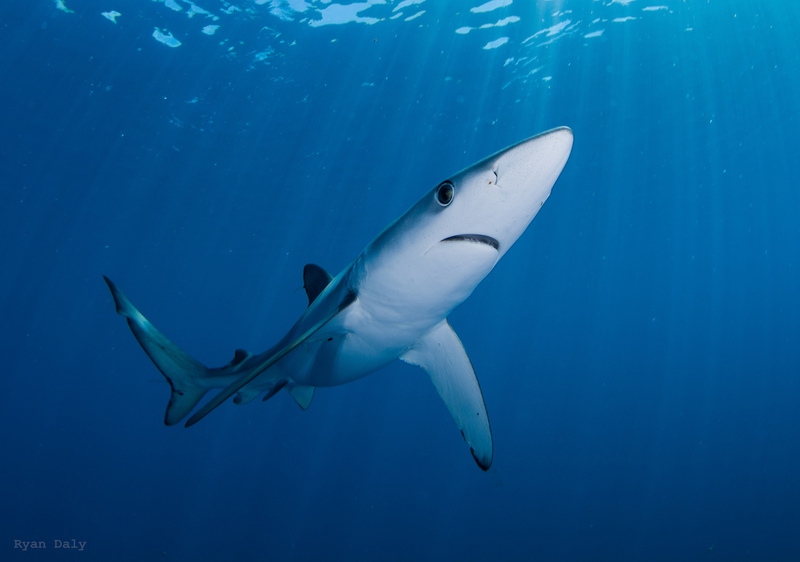 Sharks that live near to the coast or in shelf seas appear to get most of their food from local phytoplankton based food webs, but populations of these shelf sharks appear to be made up of individuals that specialise on other different types of food webs. Think of it like living in a city where you have access to lots of different restaurants and don’t have to travel far to find the food you want. On the other hand, oceanic sharks that are found throughout the world’s oceans, appear to get most of their food from phytoplankton based food webs in areas of cooler water in the northern and southern hemispheres, between 30° and 50° of latitude from the Equator. This is more like travelling long distances to spend time feeding in your favourite restaurant chains in a specific large city. The finding that most oceanic sharks get a lot of their nutrients from specific intermediate latitudes is remarkable but is supported by similar findings in other animals. Intermediate latitudes are typically areas with a lot of food because boundaries between warm and cold water trap nutrients, promoting plant growth and subsequently high abundances of animals. This isn’t saying oceanic sharks don’t feed elsewhere in the world, both in other areas and during deep diving, but these patterns are consistent with most food consumed over the previous one to two years likely coming from intermediate latitudes – either from direct foraging or interception of migratory prey that came from these regions. 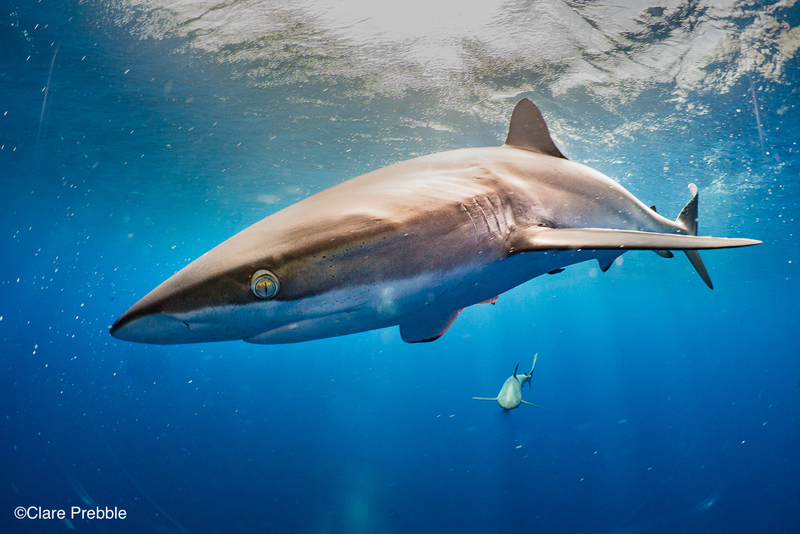 Populations of many of the most abundant sharks have declined in the last few decades, particularly in the wide-ranging oceanic sharks that are targeted by fishing boats and caught accidentally in tuna fishing as “by-catch”. 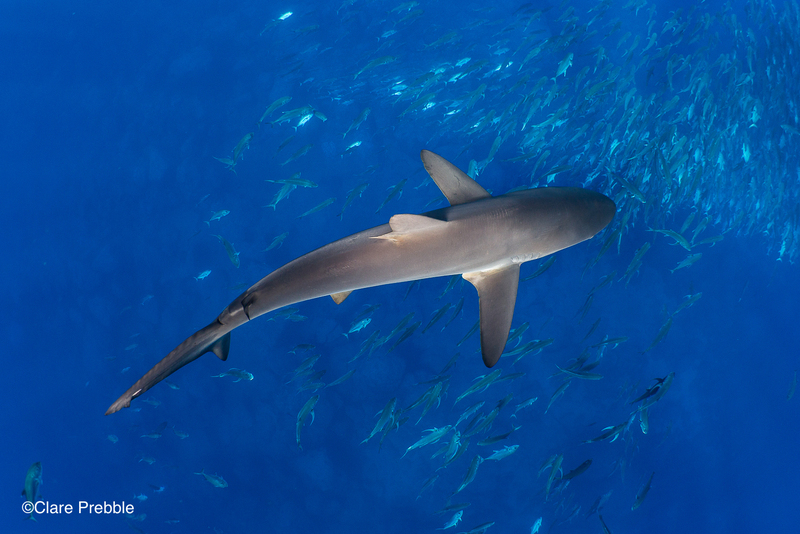 Governments are now creating large marine protected areas around the globe, which help to reduce fishing, but most of these protected areas are in tropical waters, and may not provide effective protection for oceanic sharks. We also found that many coastal and shelf shark populations appear to exploit a wide range of different food webs, with individual sharks specialising on particular resources or habitats. 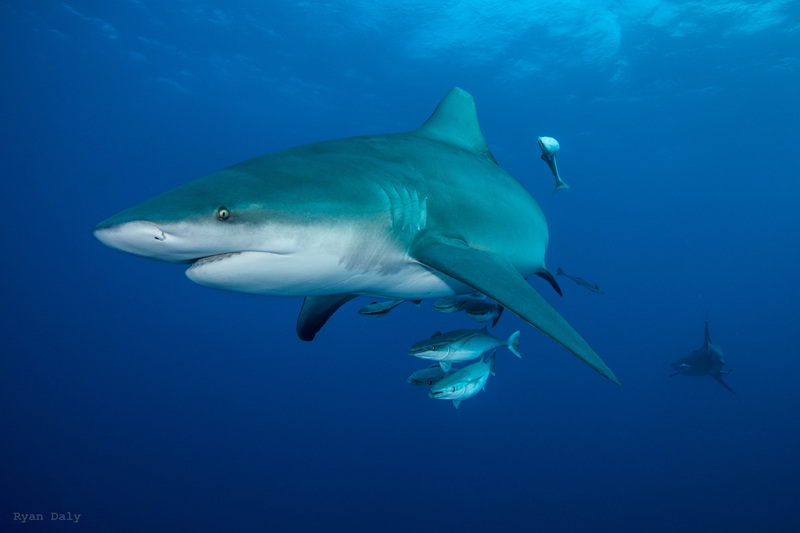 This finding adds to a growing debate about the importance of habitat diversity and connectivity for maintaining shark (and other predator) abundances. Future protective measures for coastal and shelf sharks should ensure that they encompass the diversity of food webs that support local populations. Overall we hope that increased understanding of shark feeding ecology can help global efforts to protect and conserve shark populations. Combining insights emerging from methods such as stable isotope analysis, satellite tracking and environmental DNA are giving us the information we need to design more effective protection measures. 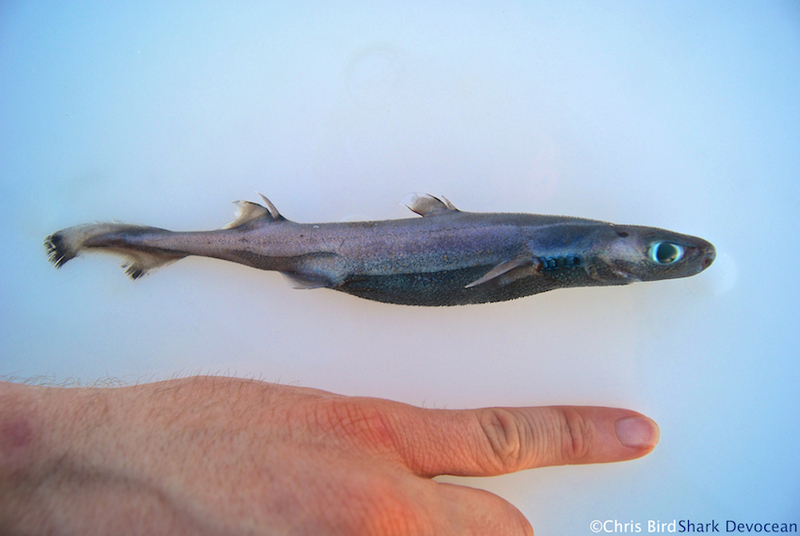 This research has now provided the foundation for the “Chondrichthyan Stable Isotope Data Project” – a global collective looking at exploring the ecology of sharks, rays and chimaeras (collectively: chondrichthyans) using stable isotope analysis. This project encourages the addition of more data and promotes it’s future use. By bringing together scientists and their data, it is hoped that we can better understand, manage and preserve chondrichthyan fishes and the broader oceans.